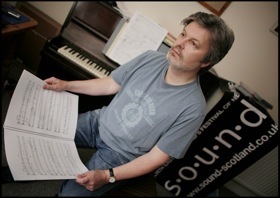 James MacMillan is one of today’s most successful living composers, also internationally active as a conductor. His musical language is flooded with influences from his Scottish heritage, his Roman Catholic faith, social conscience and close connection with Celtic folk music, blended together with influences from Far Eastern, Scandinavian and Eastern European music. MacMillan first became internationally recognised after the extraordinary success of The Confession of Isobel Gowdie at the BBC Proms in 1990. His prolific output has since been performed and broadcast around the world, placing him in the front rank of today’s composers. His major works include Veni, Veni, Emmanuel, the percussion concerto which has received more than 300 performances, a cello concerto for Mstislav Rostropovich, a major choral-orchestral work Quickening, and three symphonies. He was appointed Affiliate Composer of the Scottish Chamber Orchestra in 1990, and between 1992 and 2002 he was Artistic Director of the Philharmonia Orchestra's Music of Today series. In January 2005 MacMillan was the focus of a major retrospective in the BBC Symphony’s annual composer weekend at London’s Barbican Centre, where he conducted concerts with both the BBC Philharmonic and BBC Symphony Orchestras. MacMillan is much in demand internationally as a conductor, and has been Composer/Conductor of the BBC Philharmonic since September 2000, where he has conducted new commissions, recording projects and performances at the Bridgewater Hall, BBC Proms, Concertgebouw Amsterdam, Athens Megaron, Huddersfield Contemporary Music Festival, and an ongoing series of composer-feature concerts including Magnus Lindberg, Harrison Birtwistle and John Casken. Recent guest conducting successes include the London Symphony Orchestra’s premiere of A Deep but Dazzling Darkness and concerts with the Rotterdam Philharmonic, Sydney Symphony, NHK Symphony and Los Angeles Philharmonic. Highlights of 2005/6 include conducting his new Organ Concerto at the BBC Proms, as well as the Detroit Symphony, Easter performances of Seven last Words from the Cross with the Netherlands Chamber Orchestra and Netherlands Chamber Choir, Composer in Residence at the St Magnus Festival, and Quickening with the New Zealand Symphony Orchestra. Further ahead he will conduct the Netherlands Radio Symphony, Madrid Radio and Toronto Symphony orchestras, and his second opera in 2007 for Welsh National Opera. James MacMillan has directed many of his own works on recordings for Chandos, BIS and BMG; his next release will be the Organ Concerto and 2nd Piano Concerto with BBC Philharmonic for Chandos. He was awarded a CBE in January 2004.